The Burlington Free Press had an excellent article on the city’s upcoming ballot question regarding the banning of plastic grocery bags. This has been a trendy policy across the country in many “progressive” municipalities. But, as the article points out, the actual consequences banning the convenient little things isn’t what its banners intended. As we have pointed out before, “single use” plastic grocery bags are really multi-use, finding second lives as liners for garbage cans, for picking up pet waste, transporting dirty gym clothes, etc. Banning them requires shoppers not only to find replacements at the checkout counter that are more often than not less environmentally friendly, such as paper, but also require the purchase of heavier plastic options for trashcan liners, pet waste, etc. This is neither economically nor environmentally sound. The Free Press notes that these plastic bags can be and are being recycled. Profitably. The example they cite is the Trex corporation, which uses the recycled bags to make high quality decking, fencing, and outdoor furniture. 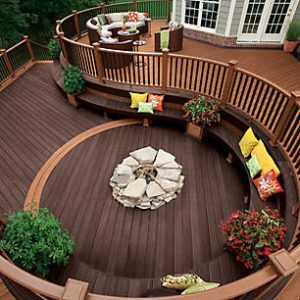 The deck pictured here is made from old plastic bags! This is the free market at work. Entrepreneurs figured out a profitable way to turn a waste product into a valuable resource, meeting a market demand for durable outdoor building materials, while at the same time solving, or at least helping to solve, an environmental problem. This costs taxpayers nothing, and, in fact increases sales tax revenues when customers purchase Trex products. Everybody wins.